Tattoo Removal Contest – Enter to Win Through December 18! One out of five people with tattoos are unhappy with their decision. In the past, getting an even larger tattoo to cover up old ink or painful removal with endless sessions were the only options. Tattoo removal has come a long way in the past few years. We’re excited to announce that the second generation PicoSure Laser is here and now available at The Shaw Center. With the ability to treat every color of tattoo, the cutting-edge PicoSure Laser gives patients results with fewer treatment sessions, treatments are more comfortable than ever before and the laser can re-treat tattoos previously treated unsuccessfully, even blue and green inks. What are you waiting for? Now through December 18, The Shaw Center is giving away free tattoo removal. 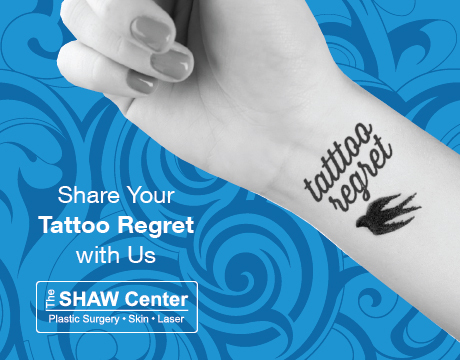 To enter, visit The Shaw Center on Facebook and submit a photo of your most regrettable ink on the “Tattoo Regret” tab. One winner will receive six free tattoo removal sessions with the PicoSure Laser – a great Holiday gift for yourself. Hurry, we are announcing the winner on December 18 so enter today!